A 500-piece Eiffel Tower puzzle is still easy to identify with 32 pieces missing. A 50-piece Kitten puzzle will probably still give warm fuzzies without 3 or 4 pieces in place. But a 32-piece dental puzzle is just not complete without ALL of the pieces. Cosmetic dentistry from The Sugar House Dentist can help. If you’re missing teeth, cutting your mouth on rough edges, or struggling with eating because of your dental puzzle, be assured that there are remedies. To understand the various types of braces, the cost of veneers, or the dental implant procedure, sit down today for the understanding consultation you deserve. Let us fill in those missing pieces—there has never been a better time to look into cosmetic dentistry. Modern cosmetic dental procedures, technologically-advanced materials, and the proficient dentistry combine to create truly dazzling smiles. 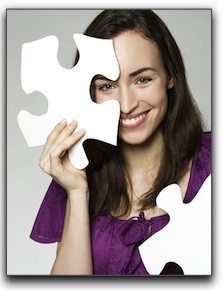 Your lucky smile could be the next puzzle to be put back together beautifully, no matter your dental disarray. Call The Sugar House Dentist. Ask us about family dentistry. Make an appointment today.